Computer Media can provide customized solutions in the following areas. For all the work we do, we provide a selection of service contracts to ensure that your equipment is well-maintained and properly functioning. Whatever your needs, we'll work to find a solution to fit within your budget and schedule. 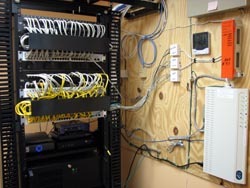 Custom server room designed and built by Computer Media with 50 outlets, digital memory thermometer, and custom server. Build custom desktop computers for any application, or provide a laptop if you need to be more mobile. Design and install networks for your home or for your business.We also have experience designing and installing media centers for classrooms, including PC stations and overhead projection systems. Upgrade your existing computers and network, or start from scratch with new construction. Service and repair many technologies, including peripherals such as printers and fax machines. If your computer is malfunctioning, or just running slower than normal, you may have viruses, spyware, or other unwanted files infecting your computer. We can get rid of these unwelcome files and make sure your computers are protected against future threats. Hard drive or media failure can cause severe stress, data loss, and lost revenue. Let us recover data from your damaged hard drive or portable media so you can get on with your life. The best computer is only useful if you can operate the software installed on it. We offer training in software applications so that you can get the most out of your machine. The internet is a visual medium, so make sure you're taking advantage of the best visual resources to communicate with your customers, or just express yourself online. We can build a website, design a logo, or enhance your existing site with professional graphics or photographs. We can also optimize your site settings so that interested customers can more easily find you online.